This simple dish is very similar to one of our favorites: roasted butternut squash orzo, which also includes spinach and cranberries. Serve it as an accompaniment to pork tenderloin or mustard-baked chicken, or on its own in a big bowl. Protein-rich quinoa, roasted sweet potatoes, tart cranberries, a splash of balsamic vinegar, and raw spinach that wilts from the warmth of the dish. Simple, colorful, healthy, and tasty. Preheat the oven to 400°F. Place sweet potatoes and red onion in a medium bowl; drizzle with olive oil and season with salt and pepper. Toss together and scatter onto a large baking sheet. Bake for 25 minutes, stirring several times, until sweet potatoes are tender. While the vegetables are roasting, make the quinoa. Using a strainer, rinse quinoa under cold water. Add quinoa, 2 cups water, and a pinch of salt to a medium saucepan; bring to a boil over medium heat. Boil for 5 minutes, then turn the heat to low and simmer for about 15 minutes, or until water has been absorbed. Remove from heat and fluff with a fork. 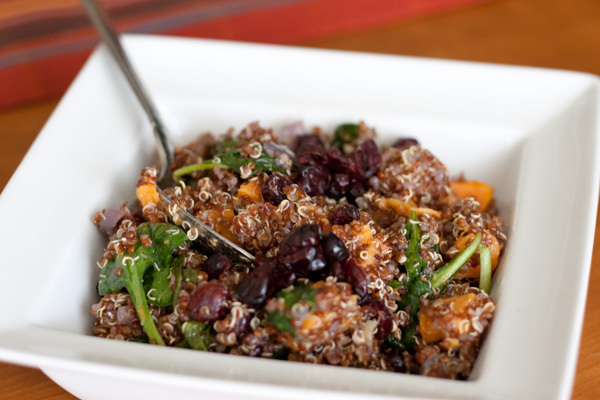 In a large bowl, combine quinoa, sweet potatoes, and red onion. Add spinach, drizzle with balsamic vinegar, and toss in dried cranberries. Stir to combine. Season with salt and pepper and serve. Just made this last night – we were missing cranberries, but it was still delicious! A very fresh, healthy meal. Thanks for sharing the recipe.